Are you going gluten-free this holiday season? 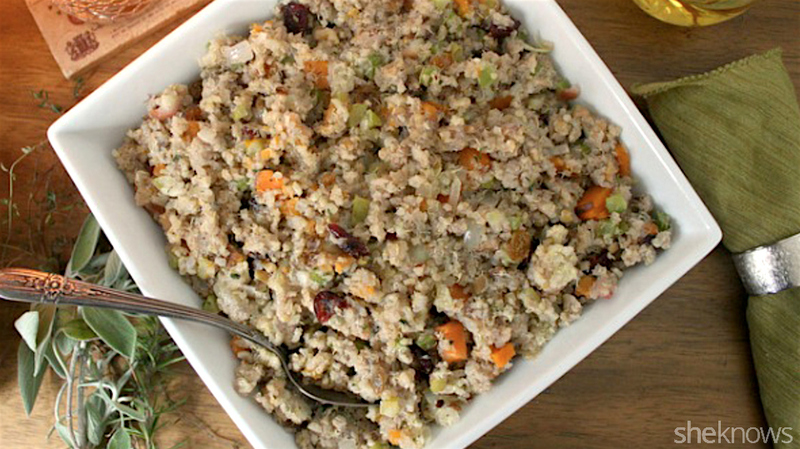 Quinoa stuffing is full of wonderful flavors and textures and is the perfect addition to your Thanksgiving dinner. This delicious recipe is packed with sweet potatoes, herbs, nuts and dried fruit — it’s truly an ideal alternative to traditional bread stuffing. Preheat the oven to 375 degrees F. Toss sweet potato cubes with olive oil and a pinch of kosher salt and place in a roasting pan. Roast sweet potato cubes in the oven for about 30 minutes, or until the sweet potatoes are cooked through and browning. Remove from the oven and set aside. Add quinoa to a large bowl. Add roasted sweet potato cubes to the quinoa. Add the onion, celery and garlic-herb mixture to the quinoa (discard the bay leaf) and stir together well. In the same pan you cooked the onion, celery and garlic mixture, over medium-high heat, add the diced apple and cook about 2 to 3 minutes, stirring often. Add cooked diced apple to the quinoa. Add craisins/raisins, nuts, apple cider vinegar, parsley and cumin to the quinoa and stir well. Salt and pepper to taste.